Coastal Post assistant editor Jeanette Pontacq on Wednesday, Nov. 7, sent email messages to several dozen people announcing that the 31-year-old monthly publication will cease publication after its December issue. In her email message, Pontacq acknowledged “perceived” financial pressures on the paper played a role in the decision to close. However, she added, “mainly differences between Don and I on content and the unacceptable demand to use copyrighted materials were the decisive factors.” She did not elaborate. 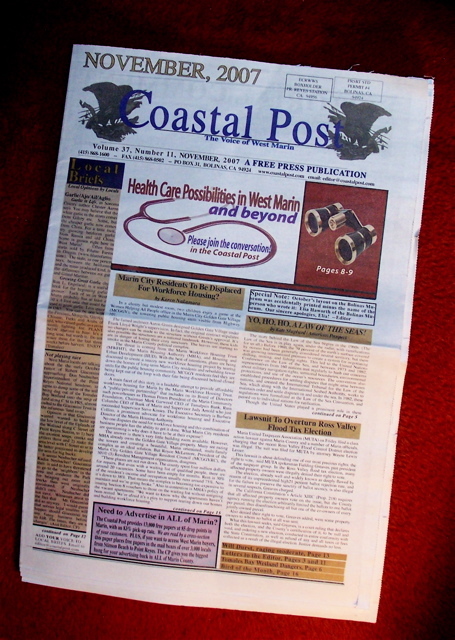 The Coastal Post has a total monthly circulation of almost 11,000 copies. Although it is delivered free through the mail in West Marin and is available at no charge on 83 newsracks countywide, a few people voluntarily pay for subscriptions. The paper has traditionally included a large amount of opinion pieces submitted by the public, as well as a stable of mostly unpaid writers. Many of the contributors have taken extreme positions, and a few have been known for their repeated condemnation of Israeli policies. As you may know, I have been contributing my time to re-inventing The Coastal Post for the last 12 months, acting both as the general editor and layout artist, as well as a writer. I did so because I believed in the need for a paper unafraid to print controversial opinions and take stands on issues, but respected enough to be read. I still believe that only when a paper is respected, rational and trusted in what is printed, can it hope to touch the hearts and minds of readers and solicit activism and change. With your help, we were able to print a number of important local stories on issues that would not have otherwise been seen in print. 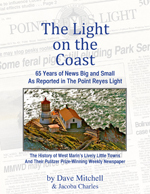 However, I am sorry to tell you that Don Deane of Bolinas, long-time publisher of The Coastal Post, will be stopping publication after a reduced edition (in old format) in December 2007. There are a number of stated reasons for this, including perceived costs, but, mainly, differences between Don and I on content and the unacceptable demand to use copyrighted materials were the decisive factors. I want to sincerely thank you for having participated over the last year in the attempt to offer both Marin and West Marin a forum for new ideas and opinions rarely seen in print these days. It is amazing and wonderful to have heard so many positive comments on how the paper was growing and changing. Yes, there were still things in the paper from the ‘old’ days that Don Deane insisted be kept, and I want to honor even those. Although I may not agree with some of these voices, I support their right to be heard and judged by readers for continued inclusion. In closing, I again want to thank YOU for the support, kind words and participation. Let’s all remember that when one door closes, others open. It is up to all of us to watch for those new open doors and keep on speaking out! Most of all, I thank Don Deane of Bolinas, who supported the paper for so many years, and financially supported the changes over the last year as well. Best wishes to all those who speak out in a rational, dynamic and realistic way in order to solicit change. I am glad that the Coastal Post is still alive! And I must tell you that Jeannette Pontacq is the only person from West Marin that I have ever added to the “block sender” in my e-mail settings! Sparsely Sage and Timely is powered by	WordPress 4.9.10 and delivered to you in 0.417 seconds using 66 queries.